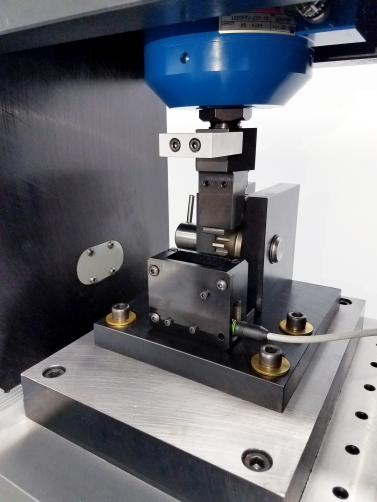 Symbirum introduces an affordable series of purpose-built, high-speed, servo-hydraulic load frames optimized for single tooth bending testing of gears. The STB-140 is ideally suited for steel gears up to 200 mm in diameter at loads up to 140 kN and frequencies up to 100 Hz. Sinusoidal loading accuracy is +/- 1 N with R values of 0.01 and Total Harmonic Disortion of less than 0.1%. Tooth deflection is measured in real time to a resolution of less than 2 microns using a non-contact laser sensor. 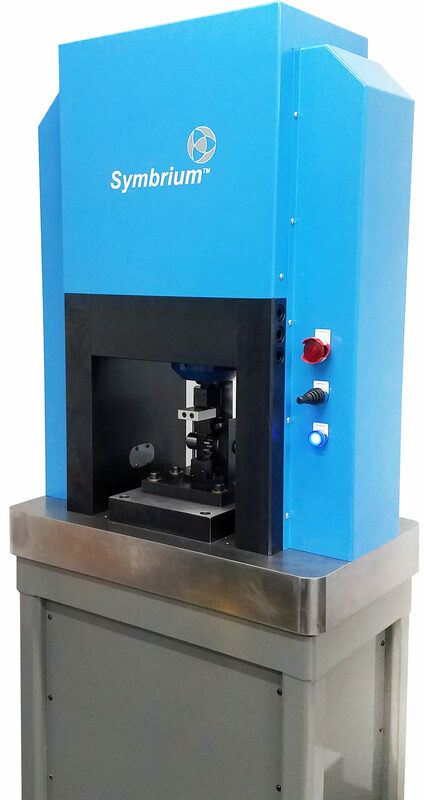 Our customers are using these machines to test SAE 1619, FZG Type C and other proprietary gear designs to determine Yield and Ultimate strength and generate fully populated S-N curves having six points at 5 finite life load levels with six 10 Million cycle suspensions in about 3 weeks per material variant! The STB-001 is oriented towards polymer gears and fine pitch gears up to 60 mm in diameter. These machines have ultra-fast dynamic response with the test gear placed inside an environmental chamber that can control the bulk temperature of test specimens from ambient to 190 C. Loading capacity is 1,000 +/- 0.1 N at frequencies up to 120 Hz. Tooth deflection measurement is +/- 2 microns. 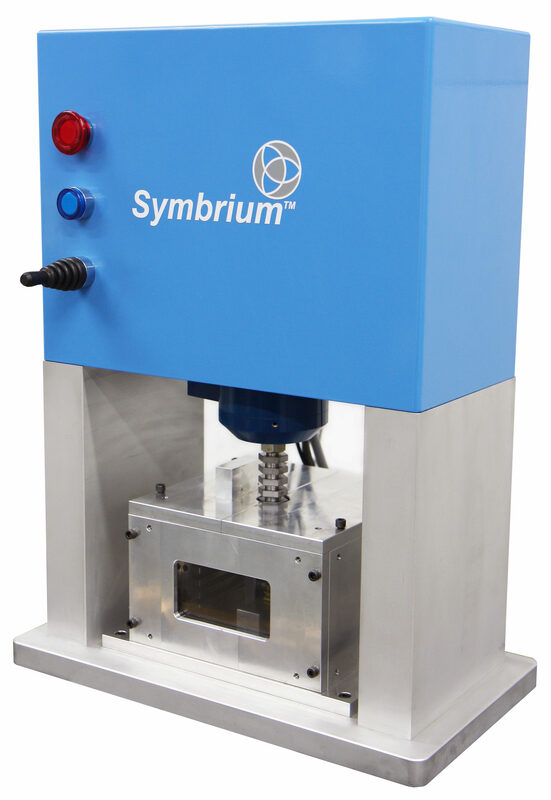 Symbrium is currently working with plastic gear industry to create a much needed industry standard for polymer gear testing including standard gear designs and testing protocols. Larger STB units for marine and industrial gears designed around the same technology are available. In keeping with our mission to provide world class affordable testing systems that require less laboratory floor space, both the STB-140 and STB-001 machines can be operated as stand-alone units with dedicated controls and hydraulic power units or as multiple machine installations using a shared controller and a centralized 200 bar HPU to operate up to six machines. Many of our customers place the HPU outside of the test cell and position several machines side by side with a common PC to facilitate accelerated testing in a comfortable environment. Low cycle fatigue tests are run during normal working hours. The machines are set up to run longer cycle tests overnight and through the weekends lights out. Like all Symbrium test systems, a browser based user interface allows remote monitoring of a test program or machine status with emails and text alerts. STB 140 machines measure 0.76 m wide by 0.45m deep by 2m high and can be placed on a simple concrete floor with no special anchors. A 200 bar hydraulic supply with 100 lpm flow rate per machine is required. Symbrium can provide HPUs that are fully integrated with the machine controller or these can be provided by the customer. STB 001 machines measure 0.5 m wide by 0.3 m deep by 0.6 m high and can be placed on a study work bench or an optional Symbrium supplied table. These machines require 100 bar hydraulic power at 10 lpm flow. The same controller is used for all Symbrium STB machines regardless of size. The Central Control Unit consists of a rack mount chassis that can be fit on or under a desk or placed into a standard server cabinet. The controller is powered by normal 120 VAC line power. International voltages are available. Plug and play cables are run from the CCU to the machines. Auxiliary connectors are provided to control Symbrium or customer supplied hydraulic units. A customer supplied PC with Sybmrium software installed is connected to the CCU via Ethernet. Symbrium can supply quiet, energy efficient Hydraulic Power Units sized for single or mutliple machine installations. These HPUs can be connected to the Symbrium STB controller using a single cable that allows fully automated control of the HPU. Test Fixtures can be designed and supplied by Symbrium for any suitable test gear. While the SAE 1619 fixture is a popular choice, most of our customers prefer the new Symbrium design which is less complicated, more flexible, easier to use and produces less data scatter. 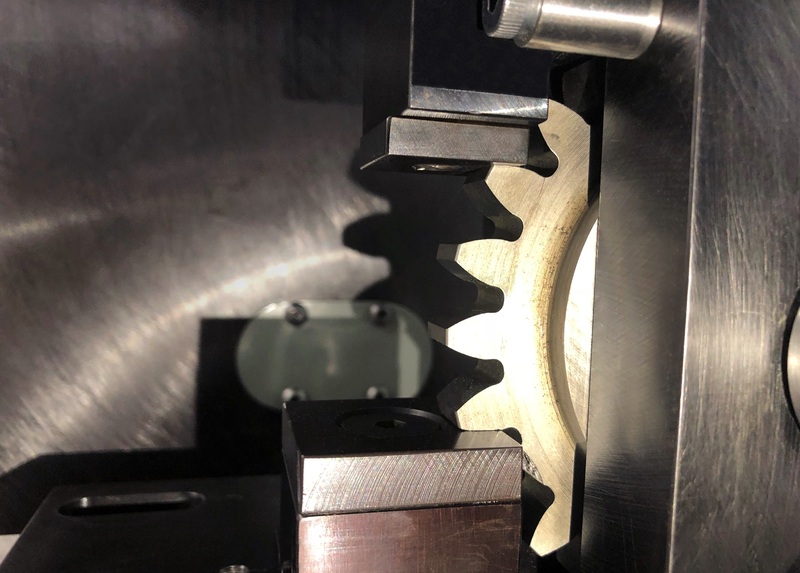 Depending upon part geometry, Symbrium has been able to design universal test fixtures that can test gears of several different customer designs little or no configuration change. Symbrium understands gear testing at a very deep level. We design high performance geared systems, we design and build gear testing systems and we operate a world-class gear material testing laboratory using our own equipment that collects data for some of the most recognized names in the automotive, aerospace, agricultural and polymer resin industries.